When generating your CSR from your Palo Alto Network system your private key will be left on the system. To generate a CSR for your Palo Alto Network system perform the following. On the bottom of the screen, click Generate. Common Name: Specify the Fully Qualified Domain Name. Signed By: From the drop down menu, select External Authority (CSR). Certificate Authority: Leave blank Do NOT check. OCSP responder: Leave as is default. Number of bits: 2048 bits or greater. Under Certificate Attributes field you will click Add and specify the following fields as it applies to your organization. State: The business registered state or province (Do not abbreviate). Locality: The Business registered location (not the actual server location). When everything is set click Generate. You will get a confirmation window pop up stating that the keypair csr creation is complete. 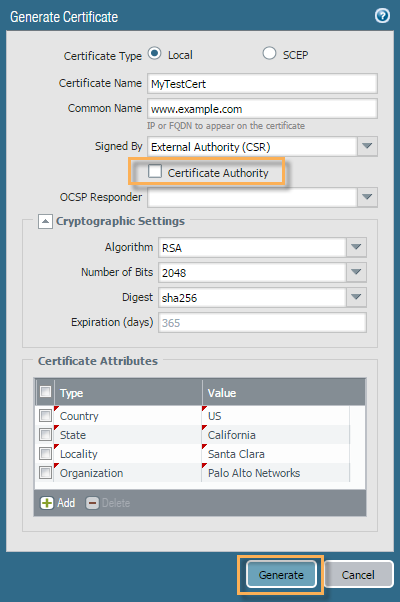 Click the box nest to the Certificate Name to select the CSR certificate request. Congrats! Your private key pair has now been created on this system. Your CSR request has been created. You will open this file in notepad and copy and paste its contents into the enrollment portal of the Certificate Authority you are getting your SSL Certificate from.